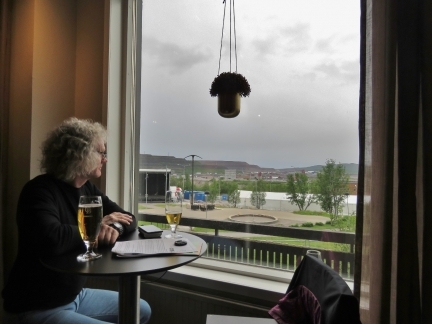 The Swedish town of Kiruna, with a population of about 17,000, made headlines in 2004 when it was announced the center would need to move 3 km east due to ground settlement resulting from mining operations nearby. 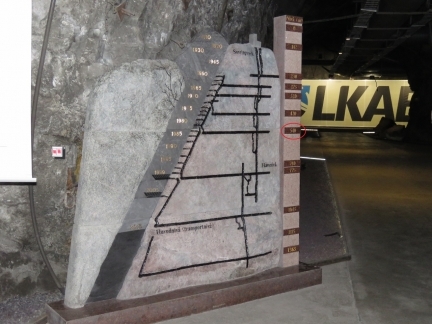 The mine, operated by LKAB, is the largest underground iron ore mine in the world and has a visitor center built deep inside. 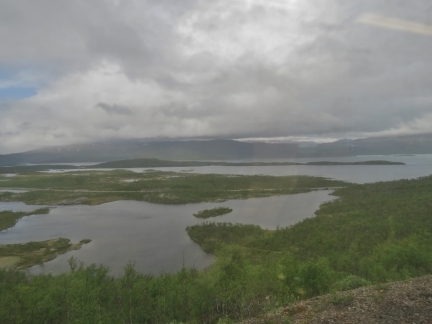 From Narvik, we rode the scenic Ofotbanen railway to the Swedish border and continued on the Iron Ore Line to Kiruna. 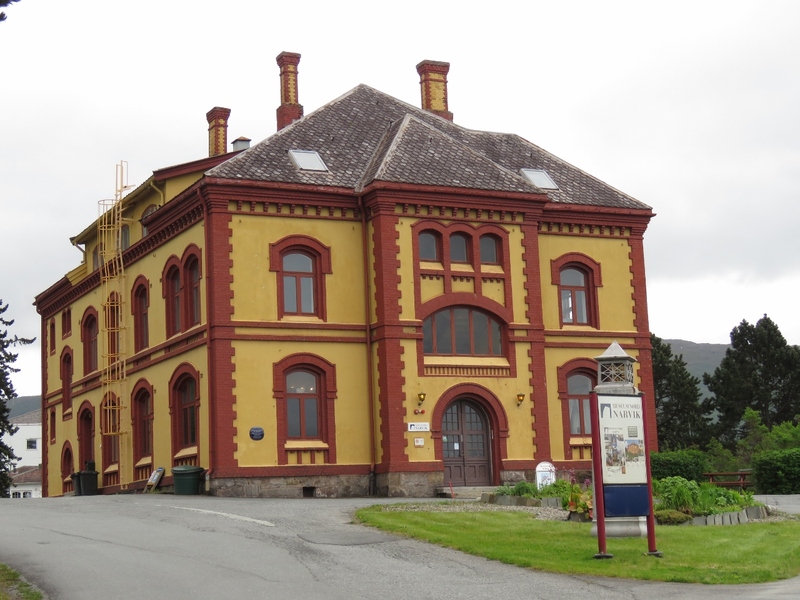 Both lines were built at the turn of the 19th century to transport LKAB’s iron ore to the ice-free port of Narvik for export. We really enjoyed the train trip and our visit to Kiruna, and had a fabulous time on the mine tour. 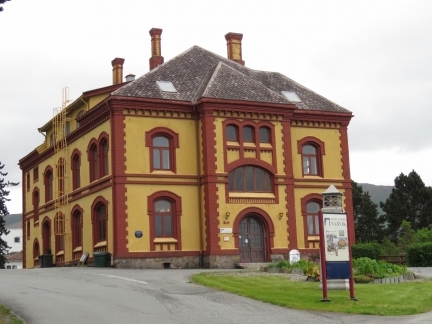 The Museum Nord is Narvik’s second museum, and focuses on the town’s history. We were particularly interested in the development of the LKAB iron ore shipping terminal and the railway to Sweden, as we’d be riding it later that day. 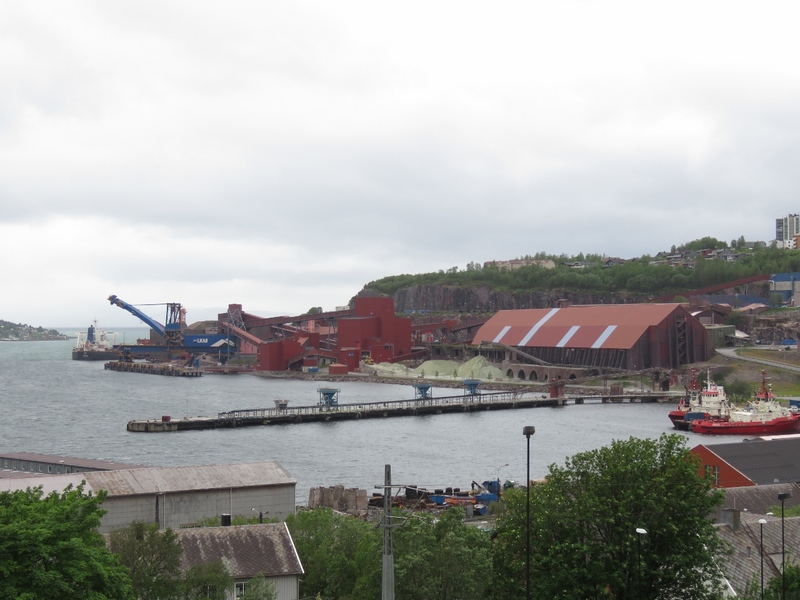 A great view to the huge LKAB iron ore pellet shipping terminal from the Museum Nord. 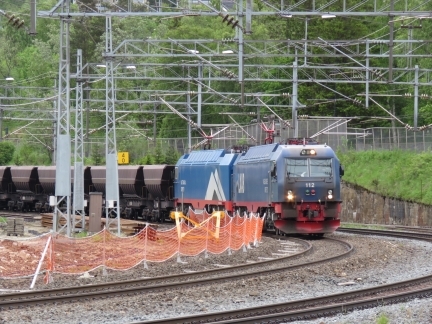 An LKAB iron ore train from Kiruna, Sweden passing through Narvik station as we are waiting for our own train to Kiruna. 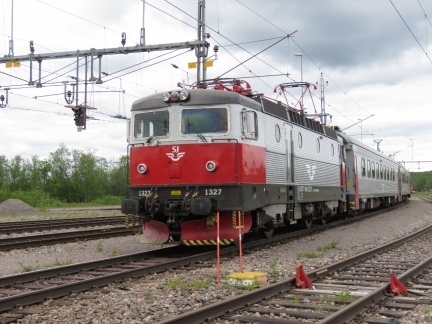 We’ll be taking the same route to Kiruna: the Ofoten Line to the Swedish border, then along the Iron Ore Line through Sweden. Roughly a dozen trains run daily in each direction from Kiruna. 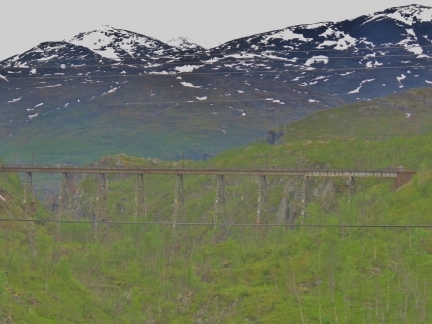 Each train has 68 cars, is 2,460 ft (750m) long and weighs 8,600 tonnes. 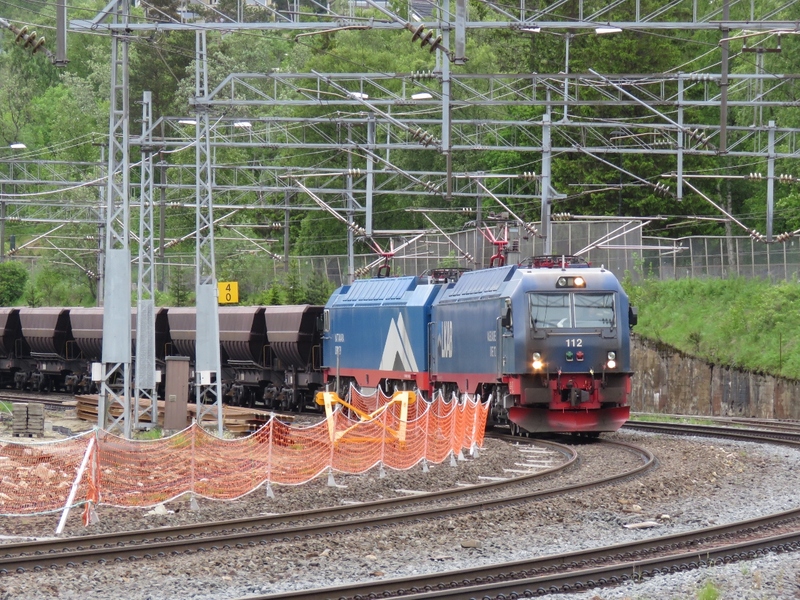 Our Swedish State Railways train arriving into Narvik. A view to the new Hålogaland Bridge suspension bridge being built over Ofotfjorden that will be the second longest bridge in the country. The Ofoten Line climbs above the sea and through the mountains to reach the Swedish border and is one of the most scenic in the country. 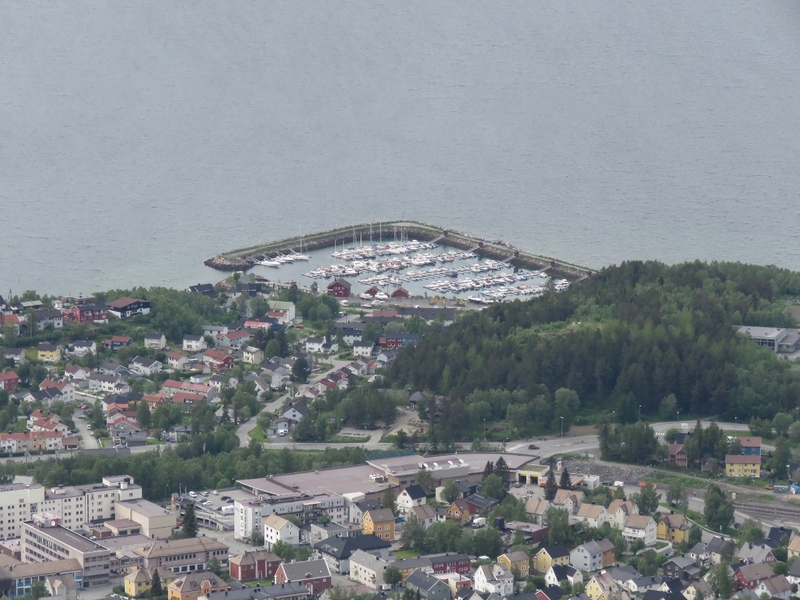 This is the view down Rombaksfjorden from 900ft up. 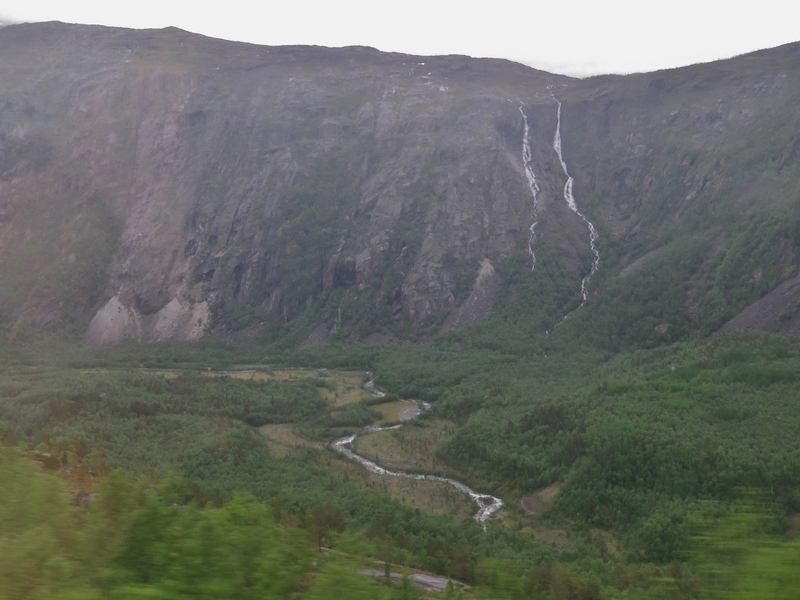 Waterfalls and river at the head of Rombaksfjorden. 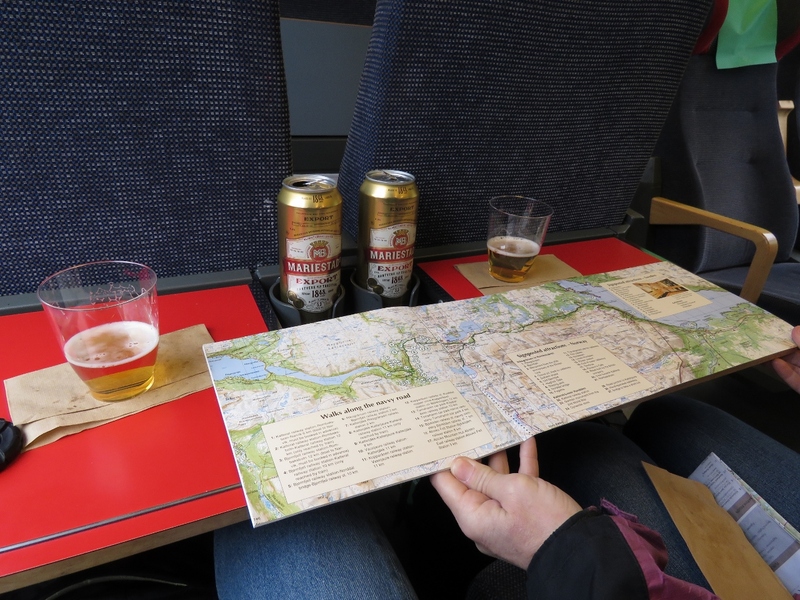 We picked up a guidebook on the Ofoten Line at the Museum Nord and are following along as we travel. We’re about to cross into Sweden and onto the Iron Ore Line, which runs 247 miles (398 km) from the border with Norway to Boden in Sweden. 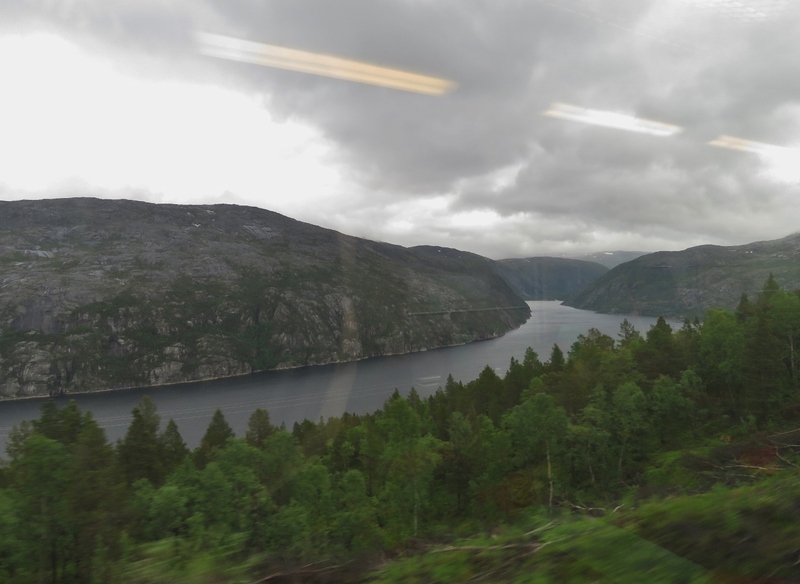 At 1,500ft up, we’re passing through a major lake district in Sweden. 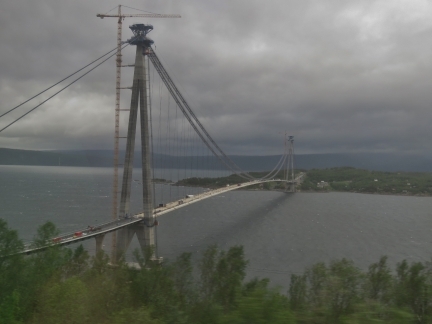 Since Norway and Sweden are both part of the Schengen area, there are no passport checks on crossing the border. We just passed directly through from one country to the next without a visible border. 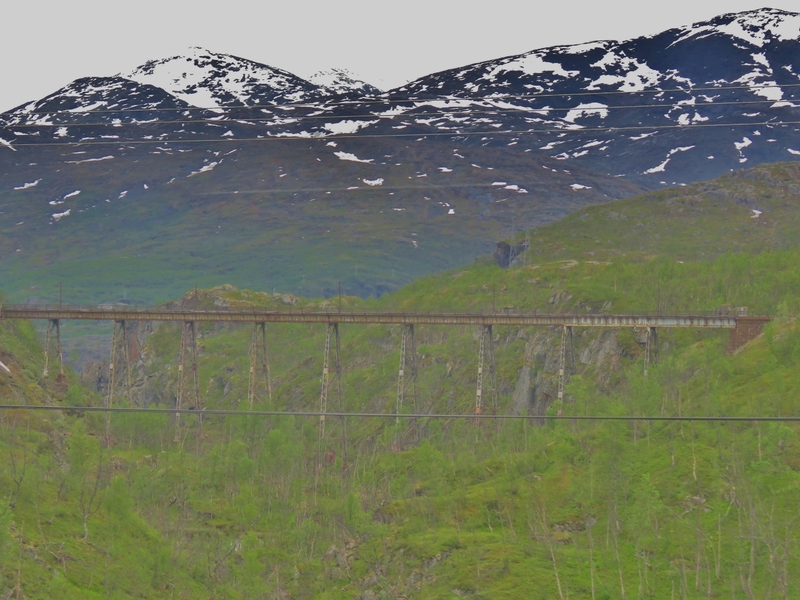 Passing an ore train heading the other way to Narvik. About three hours after departing Narvik, we’re in Kiruna, Sweden where LKAB operates the world’s largest underground iron ore mine. This is the view southwest from the edge of town to the mine property. Kiruna, with a population of about 17,000, made the headlines in 2004 when it was announced the town center would need to move 3 km east due to the town slowly settling into the underground mine. 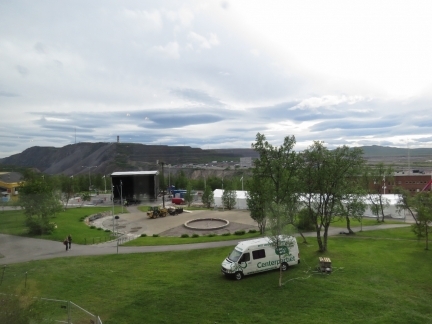 We’d arrive the day before the start of Kirunafestivalen and crews were busy setting up the stages for the event. 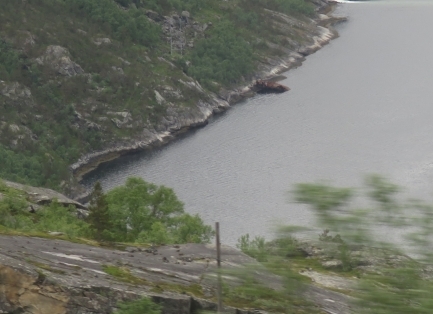 The omnipresent LKAB mine is visible in the background. The Kiruna Church, built in 1909-1912, will be relocated to the new town site. We had an exceptional steak dinner at SPiS in Kiruna. An after-dinner drink at the Solsidan Lounge in our hotel, Scandic Ferrum, with view to the LKAB Kiruna mine in the distance. 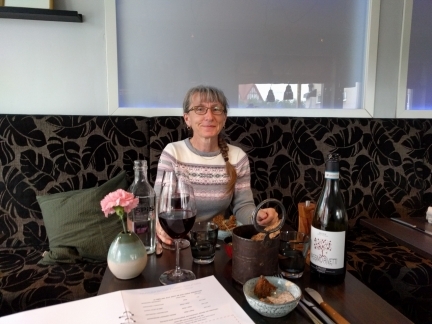 We’ve got a tour booked for tomorrow and are really looking forward to it. 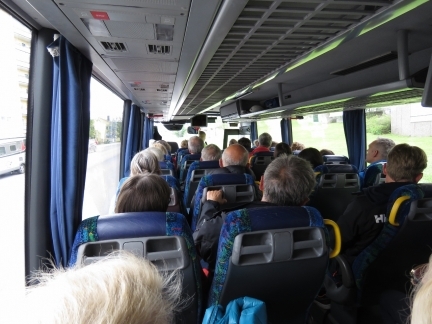 On the bus in Kiruna, just starting our drive from the visitor center to the a third of a mile below the surface of the earth. We’re heading to the LKAB Kiruna iron ore mine visitor center, built deep into the operating mine. 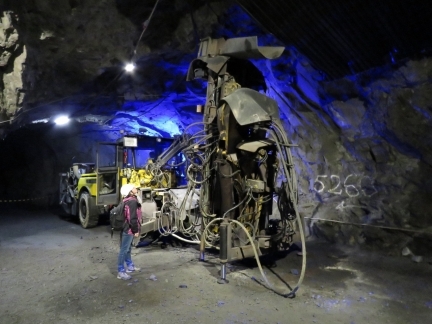 The LKAB mine visitor center is part of the live mine. 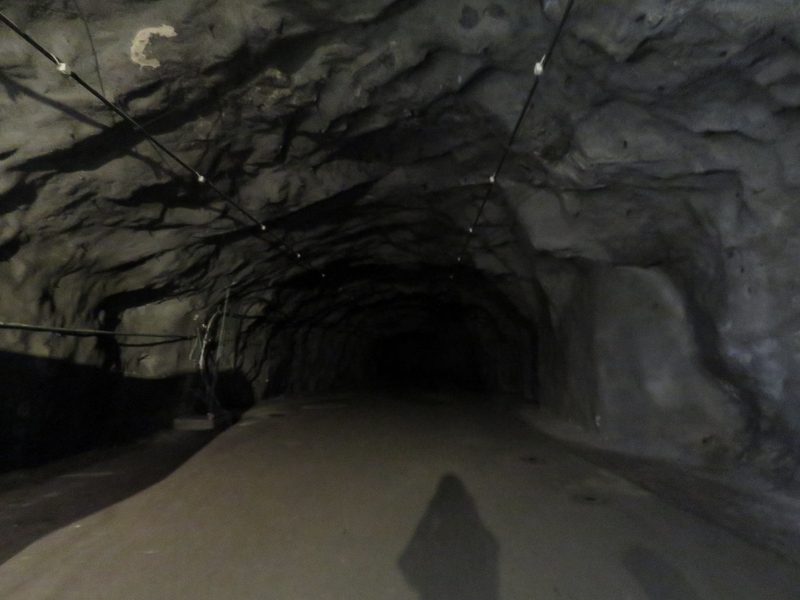 At some time in the past, this is where the work was being done but the mining has been completed at this level and the real work is 3,428 ft (1,045 m) below the original mine surface. Just the bus ride alone, down the busy road down into the mine was exciting and kind of an interesting adventure in and off itself. Here we are 540m (1,771ft) down into the Kiruna LKAB iron ore mine. 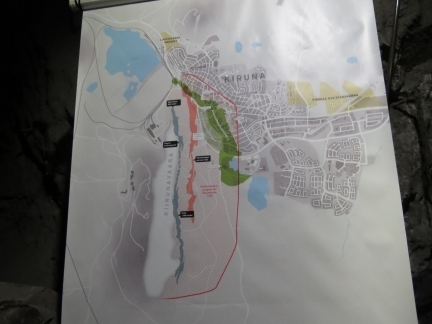 This maps shows the entire mine and our location is circled in red (click image for a larger view). The mine follows the rich iron ore seam on the left, heading deep down into the mountain. Even LKAB doesn’t know how far it goes. 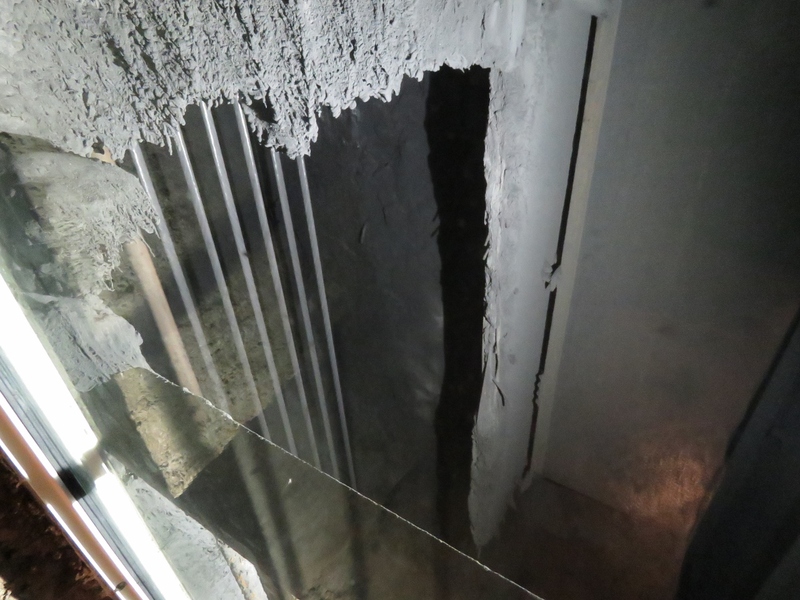 Most iron ore is mined in open pit mines, whereas this one is continuing deep below the surface. 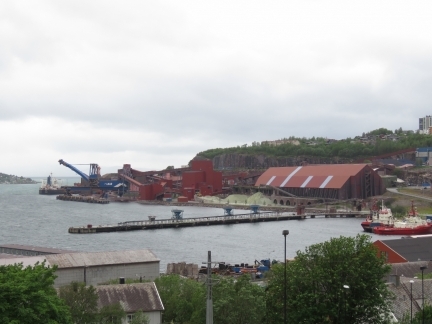 In fact, it’s the largest underground iron ore mine in the world. Clearly this is much more expensive than open-pit mining, so presumably the purity of the seam is what makes it economic. 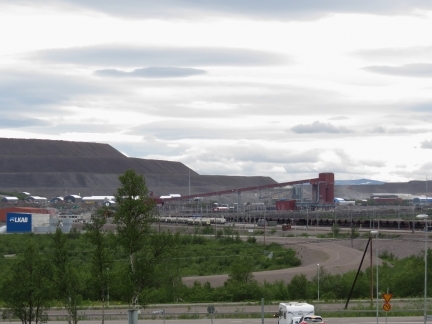 The annual production capacity of the mine is over 26 million tonnes of of ore and over more than 950 million tonnes have been removed from the site since 1898. All the ore is brought up through vertical elevator shafts, pictured on the right of map. 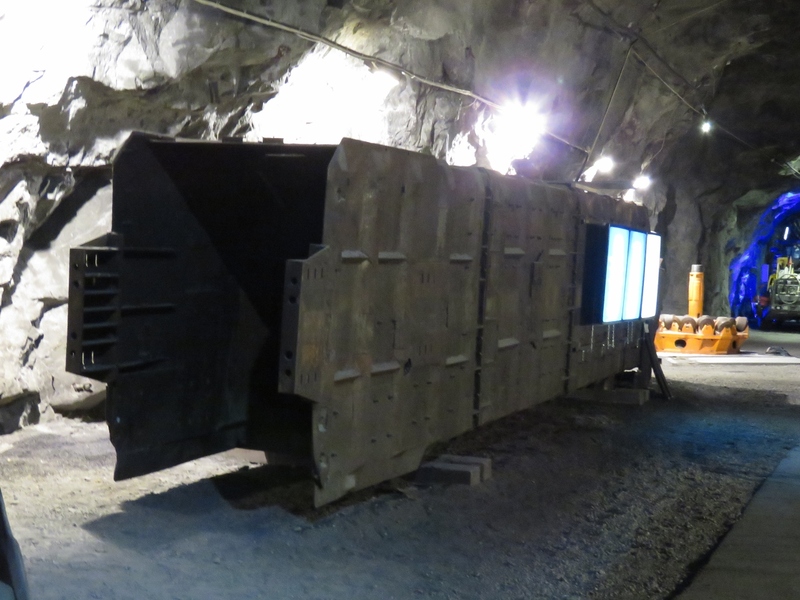 The horizontal sections that head toward the iron ore seam are where the ore is transferred from the seam to the elevators. At night, explosives placed in holed holes drilled deep into the iron ore seam are triggered, breaking up the rock so that it can be removed the next day. 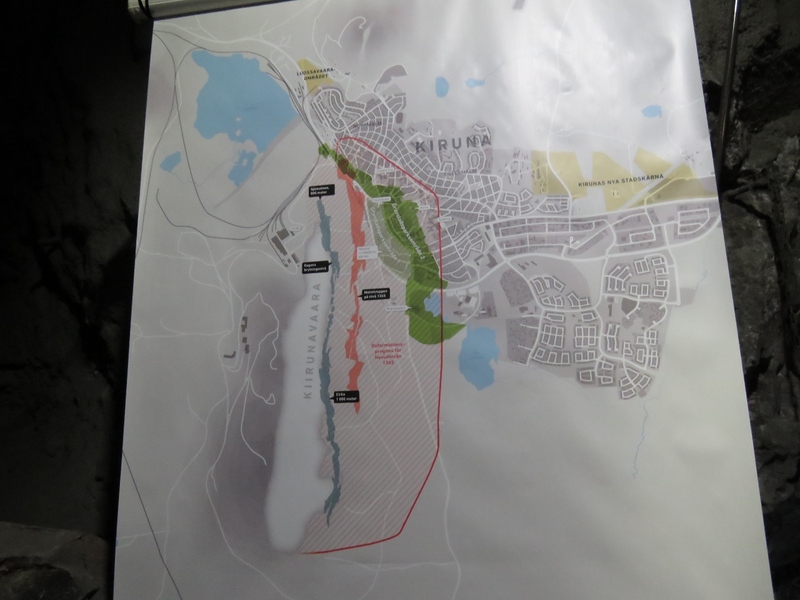 The red line on this map shows the portions of the town that are at risk as the ground subsides due to mining operations and will need to be rebuilt or relocated to the new town center 3k east. 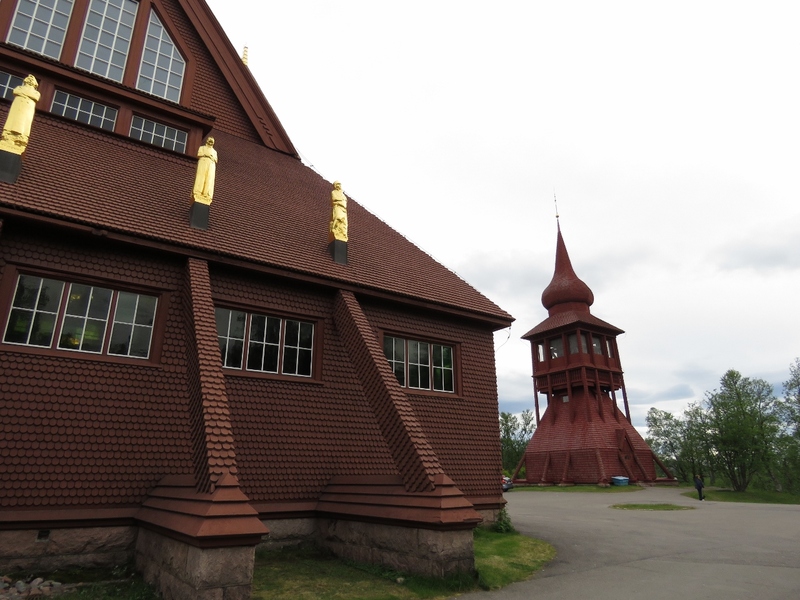 The hotel we’re staying at, Scandic Ferrum, and the Kiruna Church both are inside the line. 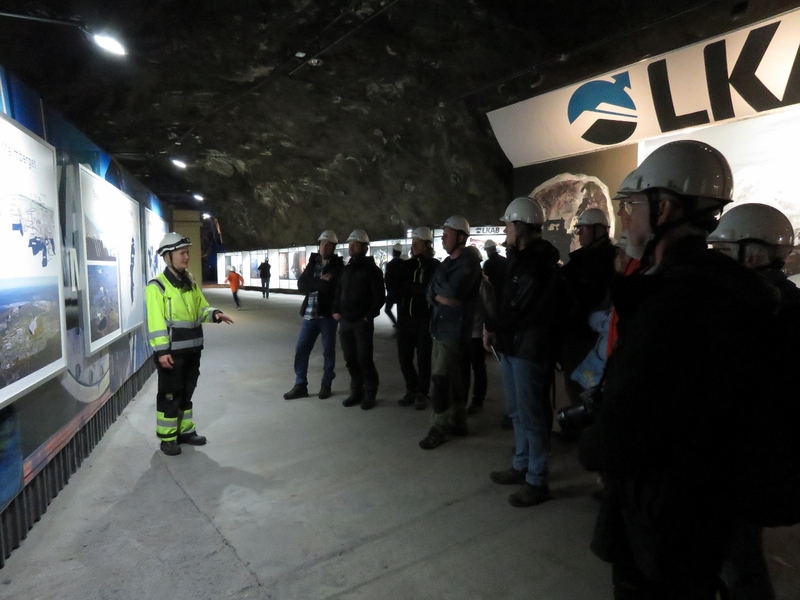 The LKAB tour guide explaining mine operations. 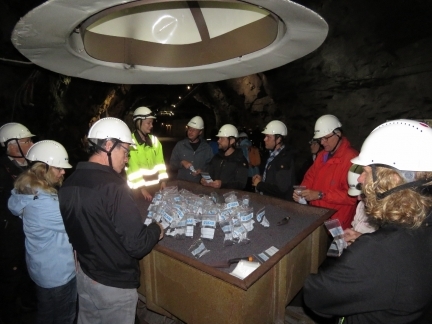 Everyone is wearing a hard-hat because we’re in a live, fully-operational mine. This is an elevator car that is suspended in the elevator shaft in the previous picture. We watched a car pass in the elevator shaft, but the car speeds are so high that it’s impossible to figure out how big it is. This massive car lying on the ground will pass in just the blink of an eye when you’re watching the elevator shaft. The visitor center has most of the equipment used in the facility on display. 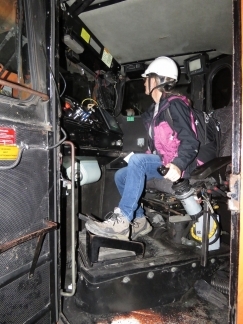 Here James standing in the shovel that attacks the freshly-exploded rock and iron ore.
Jennifer at the controls of the shovel shown in the previous picture. All the equipment is gigantic, but unusual in that they have limited vertical clearance, so they’re large but low. 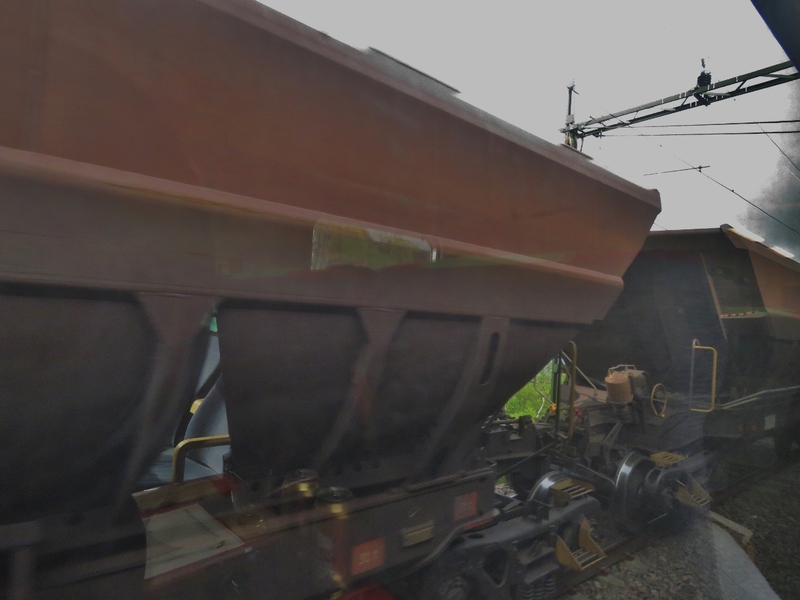 After the blasting the previous night, once the fumes have gone down and its safe for people, these vehicles are sent in to transfer the ore to the elevators. Before the hydraulic shovel shown earlier can transfer the broken-up rock and ore to the elevators, it first must be blasted free. This is the drill that will punch the holes that will later be loaded with explosives and then detonated overnight. Then it will be picked up by the shovels and loaded in the elevators. The nocturnal blasts can be felt nightly in the town. More than 54 miles (87km) of tunnels run through in the LKAB Kiruna mine. 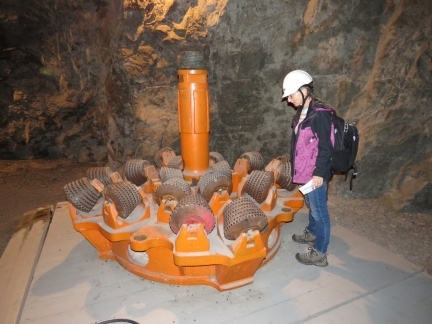 This drill looks too small to be cutting any of the tunnels that we’ve seen or been in. 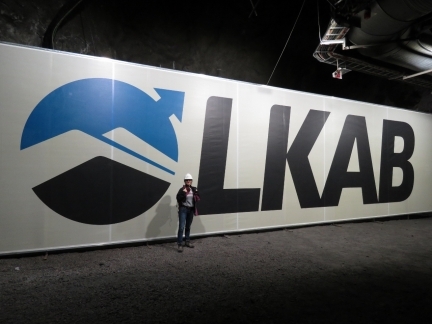 A take-home souvenir of the LKAB mine’s final product: iron pellets. The Bell Equipment model mining truck on Dirona now carries a payload of real iron-ore pellets. 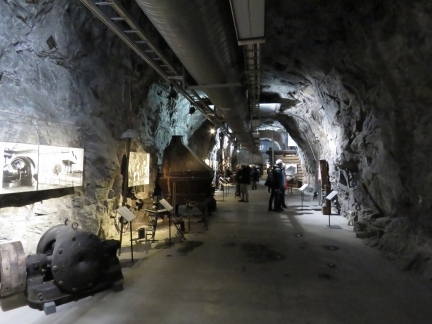 Our final stop on the tour was a visit to the LKAB museum, with a wide array of artifacts from the century of mining in Kiruna. We had a fabulous time on the LKAB mine tour. 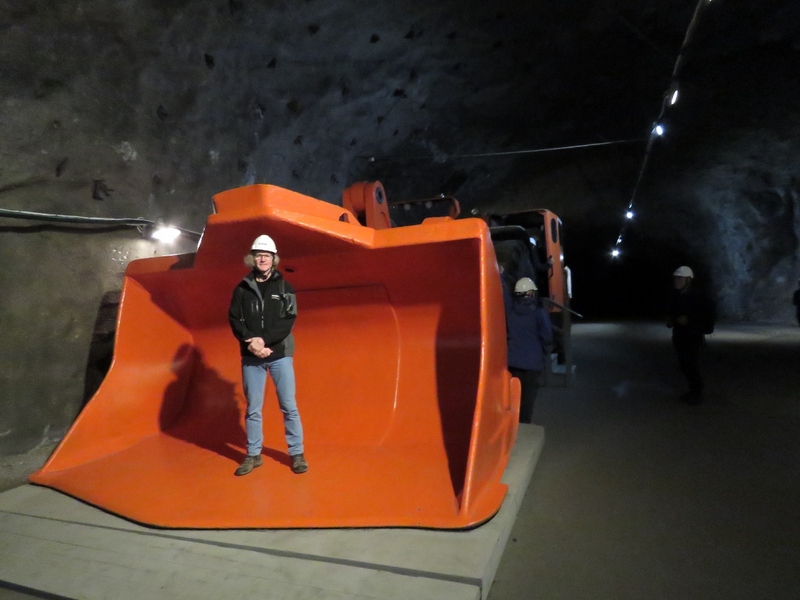 The idea of putting the visitor center deep inside the mine was brilliant. Nothing explains the scale of the operation than being in a small part of it. 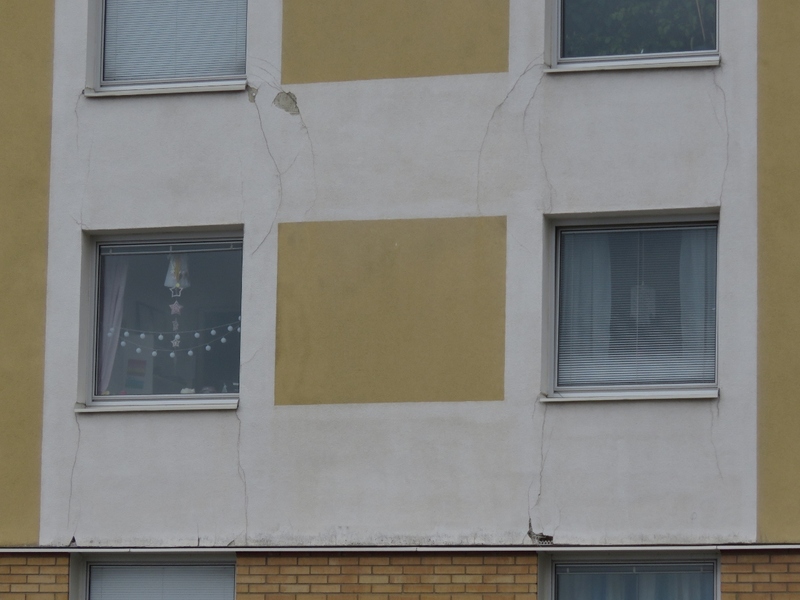 After the mine tour, we walked back to the train station through the condemned part of town and saw many buildings with cracks in them due to the mine subsidence. 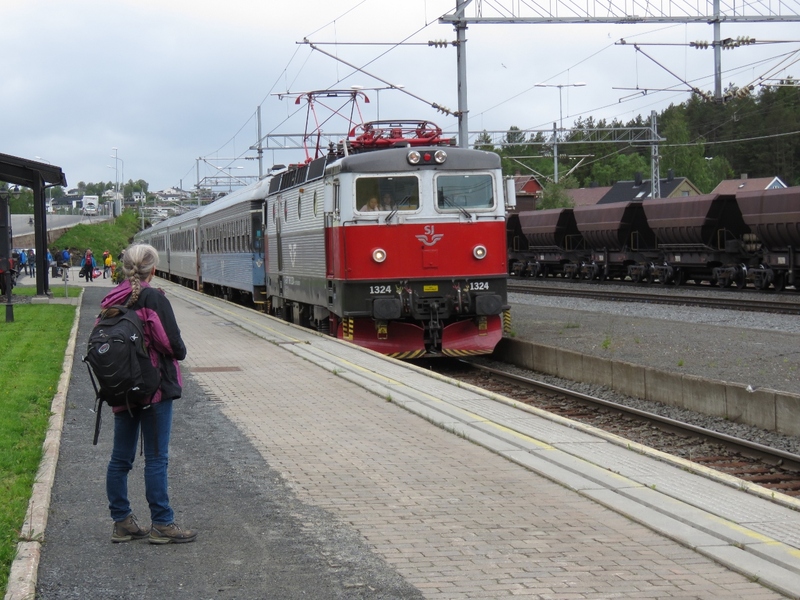 Our SJ ride back to Narvik arriving into Kiruna station. The bridge Norddalsbron was the only bridge on the Ofoten line and was replaced in 1889. The bridge not necessary, but was included in the original design to allow a sabotage point should the line fall into enemy hands. During the German occupation in World War II, an attempt to blow up the bridge failed because the cold weather compromised the explosives. 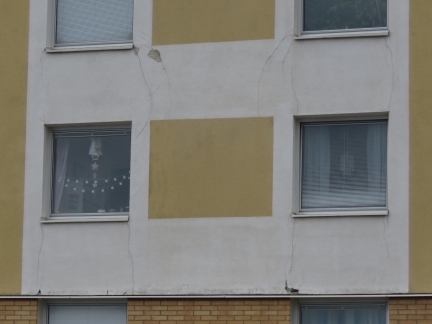 The Germans easily repaired the minimal damage from the attempted destruction of the bridge. The wreck of the German destroyer Georg Thiele along the south shore near the head of Rombaksfjorden. 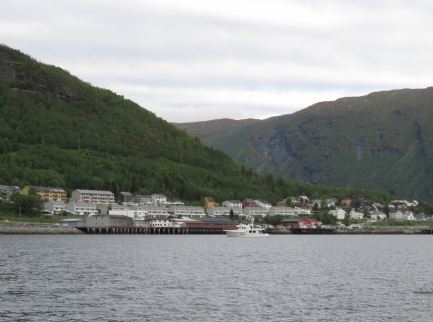 The ship was beached there on April 30th, 1940 to allow the crew to abandon ship after taking heavy damage during the Battles of Narvik. 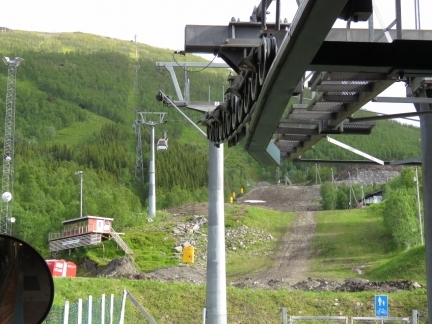 From the Narvik train station, we walked up to the cable car to take in the views from the top of Narvikfjellet (Narvik Mountain). 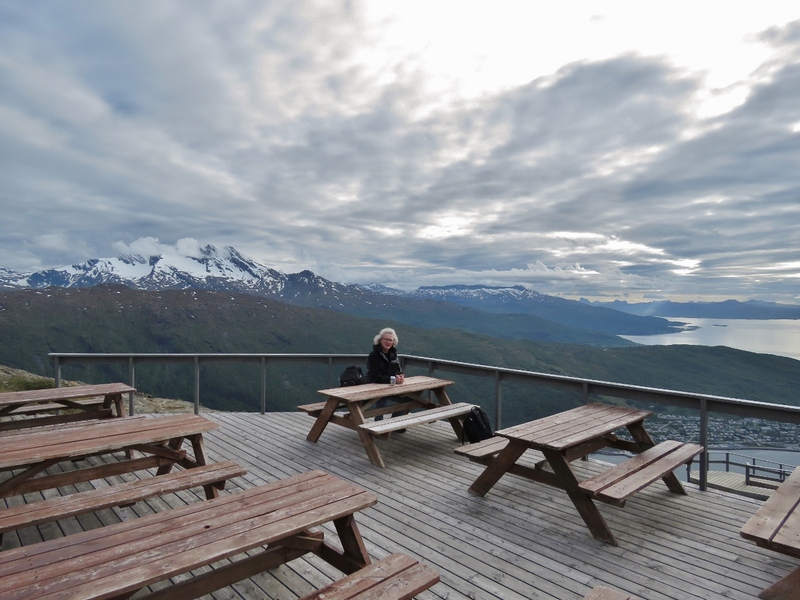 Jennifer enjoying the view from Narvikfjellet to Narvik harbor. Dirona is anchored, but not visible, directly below her. The exceptional view across Narvik harbor to Ofotfjorden from Narvikfjellet. 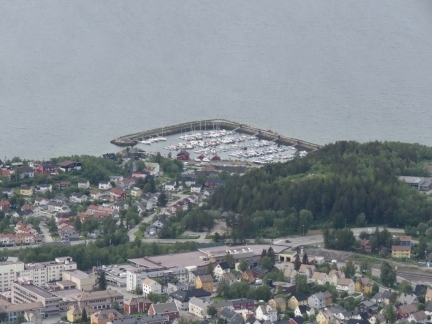 The Narvik marina, along the south shore of Ofotfjorden, viewed from Narvikfjellet. 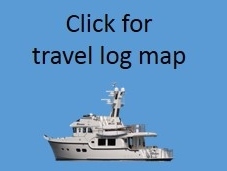 The maximum depth in the harbor is 1.5-2m, not enough for our 2.1m draft. Taking a break with mountain views atop Narvikfjellet. Our anchorage on the east shore of Narvik harbor. 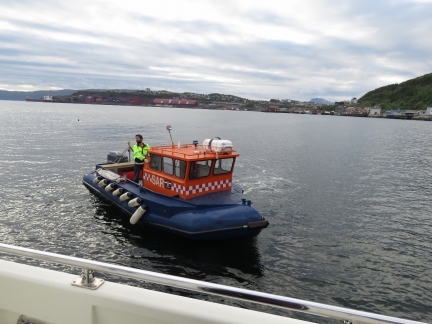 Shortly after we returned to Dirona, we got a visit from the Port Control asking us to move to make room for a cargo vessel arriving later in the day. It’s annoying their web site said there’s no restriction on anchoring for boats of our size and no permission is required, and then be asked to leave at 9pm. 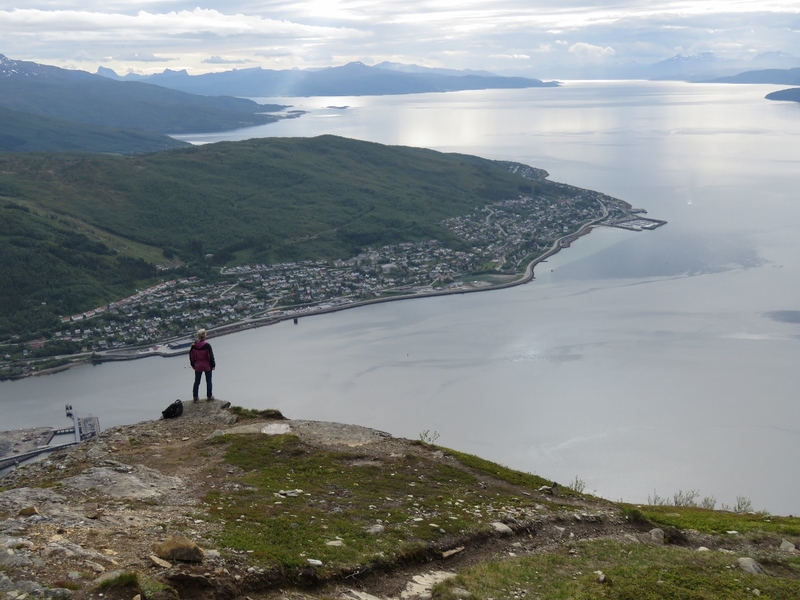 We had some concerns that the bottom would be fouled with debris considering how many ships had been sunk here during the Battles of Narvik. We’d deployed a trip line, but that wouldn’t have helped should the anchor be fouled as it was in the Orkney Islands, Scotland. The anchor came up cleanly though and we made a trouble-free and efficient departure. We found an excellent anchorage at Øysundet on the north side of Ofotfjorden from Narvik. 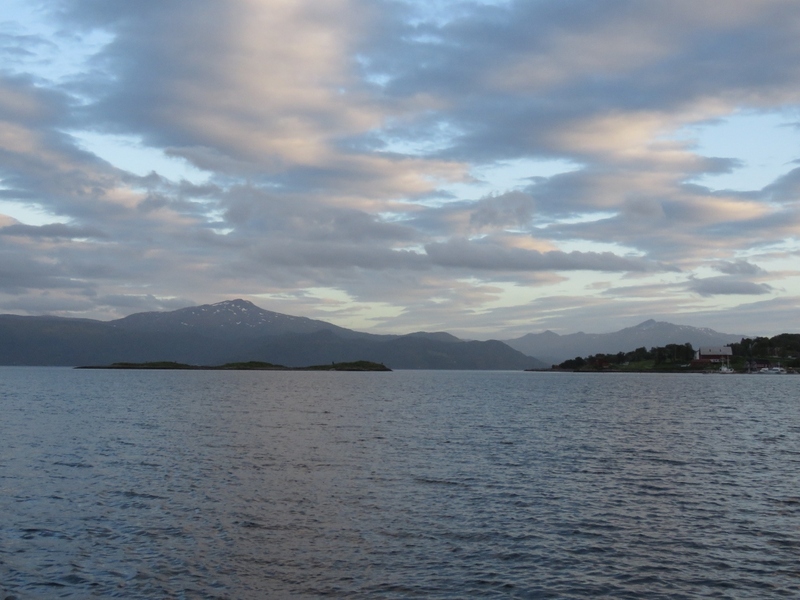 This is the view south and down Ofotfjorden at 11pm. 24-hour daylight still is a bit of a novelty for us. Kiruna is one of the wonder s of mining and I am privileged to have visited and studied the mine in 1982 under the International Program facilitated by Government of Sweden and therefore keeping track of progress at this mine from time to time. Worth visiting for any one as visitor or technocrat. We 100% agree. The mine tour was super interesting.